Toni Morrison, Marlene van Niekerk, and Anthony Appiah at the PEN World Voices Festival, 2010. African American studies and postcolonial studies similarly flesh out such issues as representation, essentialism, and nationalism. Under the rubric of these disciplines, literature and literary theory often become vehicles for social commentary. Gates writes of a need to dispel the myth of alleged primacy of “Western tradition” over the “so-called non-canonical tradition such as that of the Afro-American.” Especially conscious of the dangers of essentialism in his book The Signifying Monkey, Gates studies the need “to create a new narrative space for representing the recurring referent of Afro-American literature, the so-called Black Experience” (111). Similarly critical of essentialism, Homi Bhabha, a prominent cultural studies and postcolonial critic, connects the two fields together as he remarks: “The intervention of postcolonial or black critique is aimed at transforming the conditions of enunciation at the level of the sign . . . not simply setting up new symbols of identity, new ‘positive images’ that fuel an unreflective ‘identity politics’” (247). Bhabha even conducts a detailed reading of Toni Morrison’s Beloved in the introduction to his 1994 work, Location of Culture. Scholarship in African American studies and postcolonial studies often overlaps. Much in the same way Toni Morrison’s Playing in the Dark analyzes and enumerates the ways in which white selfhood in literary America is further constituted by objectifying “black” presence, Edward Said’s Orientalism seeks “to show that European culture gained in strength and identity by setting itself off against the Orient as a sort of surrogate and even underground self” (3). 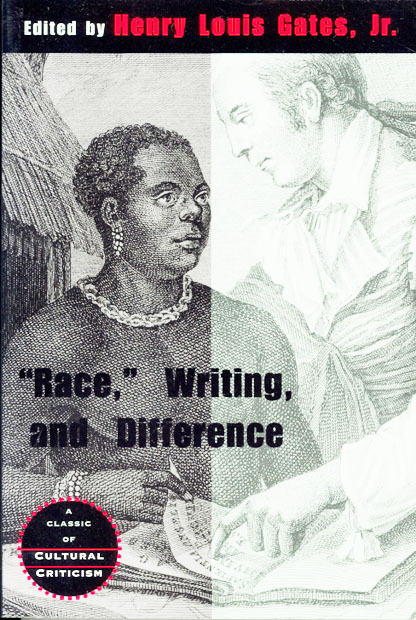 Race, Writing and Difference (1986), edited by Henry Louis Gates includes prominent postcolonial critics like Gayatri C. Spivak and Abdul R. JanMohamed. In fact, a more recent anthology edited by Gates, Identities, is co-edited by Kwame Anthony Appiah, a scholar of Afro-American studies who has also written on postcolonial theory. Such examples of overlap in scholarship compels us to reconsider deeper questions of the politics of reading and writing and the applicability of scholarly methods which enhance an understanding and emphasis on culturally sensitive modes of carving out scholarly discourse. The intersection of race, ethnicity, and gender politics has produced provocative discussions in the works of bell hooks, Barbara Christian, and Shirley Anne Williams (all African American feminist critics), as well as in the work of Gayatri Spivak and Chandra T. Mohanty. Patriarchy often becomes a metaphor, a trope of power imbalance and the culprit for the ills of colonialism and neocolonialism. bell hooks states in Outlaw Culture, “For contemporary critics to condemn the imperialism of the white colonizer without critiquing patriarchy is a tactic that seeks to minimize the particular ways gender determines the specific forms oppression may take within a specific group” (203). Alongside this obvious intersection of marginalized positions comes the risk of totalizing. Barbara Christian, in “Race for Theory” which cautions against essentialist constructions of black womanhood, compares the dangers of an overly prescriptive black feminism to the monolithic, monotheistic Black Arts Movement of the 1960s and 70s. Chandra Mohanty urges against the same essentializing practice in the growing discourse on Third World feminism. Discussions of class are similarly called for in both fields of study. Interestingly, Hooks comments upon what she sees as an overlooked problem in cross-cultural feminist discussion in Yearning: Race, Gender, and Cultural Politics. She states, “We often forget that many Third World nationals bring to this country the same kind of contempt and disrespect for blackness that is most frequently associated with white imperialism” (93). Ann Ducille’s essay “Postcolonialism and Afrocentricity” not only highlights some concerns about the threat of essentialism in both disciplines but it also suggests the possibility for what she considers the dangerous possibility of the interchangeability of the two. She states, “Whereas the critique posed by African American studies and the alternative (non-Eurocentric) worldview asserted by Afrocentricity cut uncomfortably close to home, postcoloniality seems to offer its opposition from a distance—as Gayatri Spivak might say, “in other worlds” (34). Scholarship seems to be moving towards an even more self-conscious appraisal of individual, subjective identities. Specificity in deconstructions of “race” becomes one method to combat the unproductive lumping together of all “marginalized” voices. Gates, Christian, and Sara Suleri (see Identities) are among others who often work against what they see as an unproductive totalizing of all “minority” discourse(s). Reconfiguring American studies may serve as a discipline of common ground as some scholars, like Hazel Carby and Mario Garcia, work to question basic tenets of American historiography. Others, like Ella Shohat, encourage the compatibility between the distinct realms of ethnic studies and postcolonialism. Meanwhile, critics encourage further questioning of the similarities and differences between multiculturalism, postcolonialism, and ethnic studies and their developments in relation to the lingering threat of cultural closemindedness. Appiah, Kwame A. and Henry L. Gates, eds. Identities. Chicago: University of Chicago Press, 1995. —. “The Multicultural Wars.” Radical History Review 54 (1992): 7-18. Christian, Barbara. “The Race for Theory.” Within the Circle. Ed. Angela Mitchell. Durham: Duke University Press, 1994. Ducille, Ann. “Postcolonialism and Afrocentricity: Discourse and Dat Course.” The Black Columbiad. Eds. Werner Sollors and Maria Diedrich. Cambridge: Harvard University Press, 1994. Garcia, Mario T. “Multiculturalism and American Studies.” Radical History Review 54 (1992): 49-56. Gates, Henry L., ed. “Race,” Writing, and Difference. Chicago: University of Chicago Press, 1986. Gates, Henry Louis. The Signifying Monkey. New York: Oxford University Press, 1988. —. Yearning: Race, Gender, and Cultural Politics. Boston: South End Press, 1990. Mohanty, Chandra T.et al, ed. Third World Women and the Politics of Feminism. Bloomington: University of Indiana Press, 1991. Morrison, Toni. Playing in the Dark. New York: Vintage Books, 1993. Shohat, Ella. “American Orientalism.” Suitcase: A Journal of Transcultural Traffic 2 (1997): 56-62.
tell me and I’ll remove it. Either way keep up the good work.